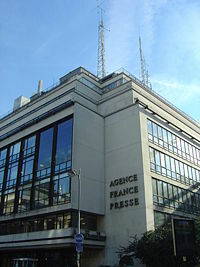 Agence France-Presse (AFP) is the oldest news agency in the world, and one of the three largest, together with Associated Press and Reuters. It is the largest French news agency. Founded by Charles-Louis Havas (as Agence Havas) to provide news about France to foreign customers, the agency was suppressed during German occupation in the Second World War. After the liberation of Paris, journalists from the French Resistance quickly set up the agency as the voice of liberated France, under the name Agence France-Presse. Established after the war as a state enterprise, AFP now operates independently, with its statute demanding that it not be controlled by any ideological, political, or economic group. AFP continues to be based in Paris, with regional centers in Washington, Hong Kong, Nicosia, and Montevideo as well as bureaus in 110 countries. It transmits news in French, English, Arabic, Spanish, German, Portuguese, and Russian. With its "guarantee of excellence"—editorial quality and reliability, the guiding principle of speed and accuracy, diversity and dynamism, innovative multimedia products, and a long service tradition—AFP aims to maintain and strengthen its position as one of the greatest news agencies in the world. With such a vision comes responsibility, and mere assurance of independence may not be sufficient to succeed; a standard of excellence in morality, truth, and goodness, is also needed. The Agence France-Presse (AFP) was founded in 1835 by a Parisian translator and advertising agent, Charles-Louis Havas as Agence Havas. 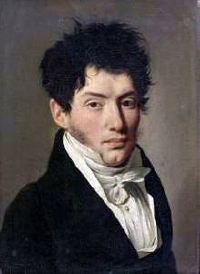 Havas translated information from abroad for the French national press, and, aware of their growing interest in international affairs, in 1832 he created his own company, Bureau Havas, supplying news about France to foreign customers. Established as Agence Havas in 1835, the first news agency devoted to news gathering and dissemination, Havas' agency initially relied on traditional methods of carrying the news such as carrier pigeon. They quickly adopted new technology such as the railroad and telegraph. The idea of such a news agency to distribute news to the media soon caught on in other countries, with the equally successful Associated Press in the United States, and Reuters in the United Kingdom. Agence Havas was also an early adopter of advertising, setting up their internal advertisement division in 1852. 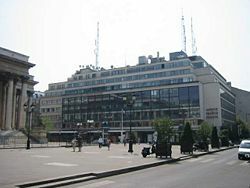 In 1857 it merged with Société Générale des Annonces to become a leading publicity company in Europe. Two of Havas' employees, Paul Julius Reuter and Bernhard Wolff, later set up rival news agencies (Reuters in London and the Wolff Agency in Berlin). In order to reduce overheads and develop the lucrative advertising side of the business, Havas’ sons, who had succeeded him in 1852, signed agreements with Reuter and Wolff, giving each news agency an exclusive reporting zone in different parts of Europe. This arrangement lasted until the 1930s, when the invention of short-wave wireless improved and cut communications costs. To help Havas extend the scope of its reporting at a time of great international tension, the French government financed up to 47 percent of its investments. When German forces occupied France in 1940 during World War II, the news agency was taken over by the authorities and renamed the French Information Office (FIO); only the private advertising company retained the name Havas. On August 20, 1944, as Allied forces moved on Paris, a group of journalists in the French Resistance seized the offices of the FIO and issued the first news dispatch from the liberated city under the name of Agence France-Presse. Established as a state enterprise, AFP devoted the post-war years to developing its network of international correspondents. One of them was the first Western journalist to report the death of Joseph Stalin, on March 6, 1953. AFP was keen to shake off its semi-official status, and on January 10, 1957, the French parliament passed a law establishing its independence. Since that date, the proportion of the agency’s revenues generated by subscriptions from government departments has steadily declined. Despite the history of early adoption of technology, AFP found itself behind competitors such as Reuters in using computers and other advances, which Reuters had begun to use in 1964. This, along with disorganization, placed the company in financial peril as they began losing hundreds millions of francs a year in the 1980s. To address this problem, AFP opened new international offices, began a financial news wire, and adopted new technology, helping them to generate more revenue. In 1982, the agency began to decentralize its editorial decision-making by setting up the first of its four autonomous regional centers, in Hong Kong. Each region has its own budget, administrative director, and chief editor. AFP offers a number of services other than its newswire. "Lifestyle Europe" is a collection of stories on travel, celebrities, food, fashion, and other such lifestyle items in Europe. AFP offers e-mail news items to subscribers. AFP also has a large image service. In September 2007, the AFP Foundation was launched to promote higher standards of journalism worldwide. The aims of this foundation are to "train journalists in developing countries, conduct press-relations workshops for humanitarian groups, provide curricula to high schools and universities, and organize seminars on issues facing the media." The foundation will operate in English, French, Spanish, and Arabic. It initially began operations in Tunisia and Syria. The foundation also hosts debates on the freedom of the press, ethics, and working conditions for journalists. Three representatives of the government. One is named by the prime minister, another by the minister of finance, and a third by the minister of foreign affairs. The board elects the CEO for a renewable term of three years. The AFP also has a council charged with ensuring that the agency operates according to its statutes, which mandate absolute independence and neutrality. The primary client of AFP is the French government, which purchases subscriptions for its various services. In practice, those subscriptions are an indirect subsidy to AFP. The statutes of the agency prohibit direct government subsidies. ↑ History Agence France-Presse. Retrieved December 31, 2007. ↑ "AFP Launches Worldwide Training Foundation". Retrieved December 31, 2007. ↑ AFP a guarantee of excellence AFP 2007. Retrieved December 31, 2007. All links retrieved February 17, 2016. This page was last modified on 8 February 2019, at 17:21.